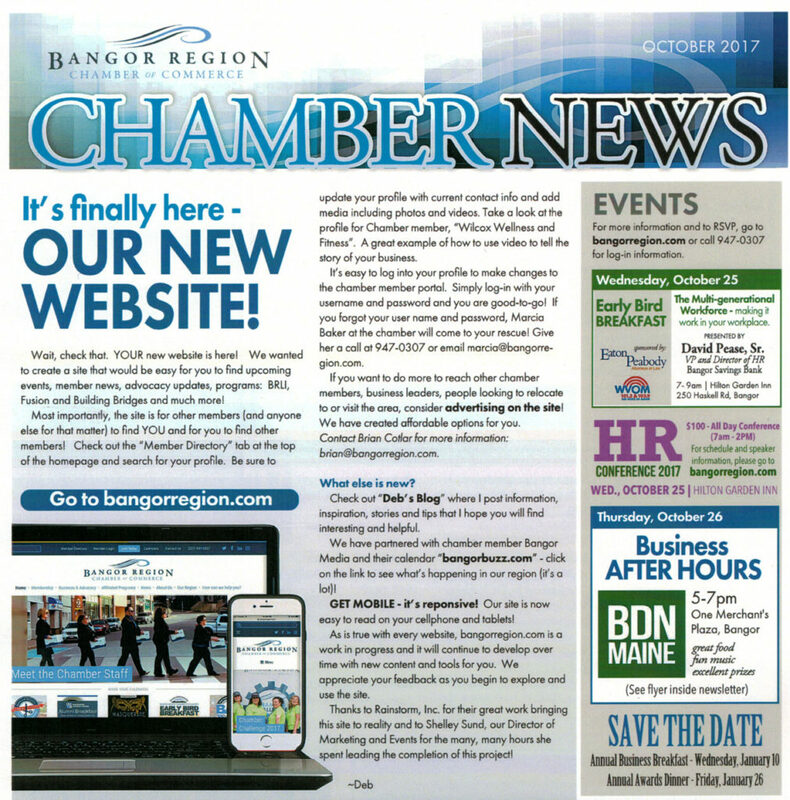 The Bangor Region Chamber of Commerce published a lovely article in their October 2017 newsletter announcing their new website! Here’s the article by Chamber president Deb Neuman. It’s finally here – OUR NEW WEBSITE! Wait, check that. YOUR new website is here! We wanted to create a site that would be easy for you to find upcoming events, member news, advocacy updates, programs: BRLI, Fusion and Building Bridges and much more! Most importantly, the site is for other members (and anyone else for that matter) to find YOU and for you to find other members! Check out the “Member Directory” tab at the top of the homepage and search for your profile. Be sure to update your profile with current contact info and add media including photos and videos. Take a look at the profile for Chamber member “Wilcox Wellness and Fitness“. A great example of how to use video to tell the story of your business. It’s easy to log into your profile to make changes to the chamber member portal. Simply log-in with your username and password and you are good-to-go! If you forgot your username and password, Marcia baker at the chamber will come to your rescue! Give her a call at 947-0307 or email marcia@bangorregion.com. If you want to do more to reach other chamber members, business laters, people looking to relocate or visit the area, consider advertising on the site! We have created affordable options for you. Contact Brian Cotlar for more information: brian@bangorregion.com. Check out “Deb’s Blog” where I post information, inspiration, stories and tips that I hope you will find interesting and helpful. We have partnered with chamber member Bangor Media and their calendar “bangorbuzz.com” – click on the link to see what’s happening in our region (it’s a lot)! GET MOBILE – it’s responsive! Our site is now easy to read on your cell phone and tablets! As is true with every website, bangorregion.com is a work in progress and it will continue to develop over time with new content and tools for you. We appreciate your feedback as you begin to explore and use the site. Thanks to RainStorm, Inc. for their great work bringing this site to reality and to Shelley Sund, our Director of Marketing and Events for the many, many hours she spent leading the completion of this project!